Have you ever wondered, How do they do that? A master shares his secrets for tying a lifelike stonefly nymph. TYING REALISTIC FLIES MAY SEEM A BIT INTIMIDATING, but with a little insight and understanding, it is not hard to do. When it comes to making realistic flies as art, there are no rules or patterns to follow. 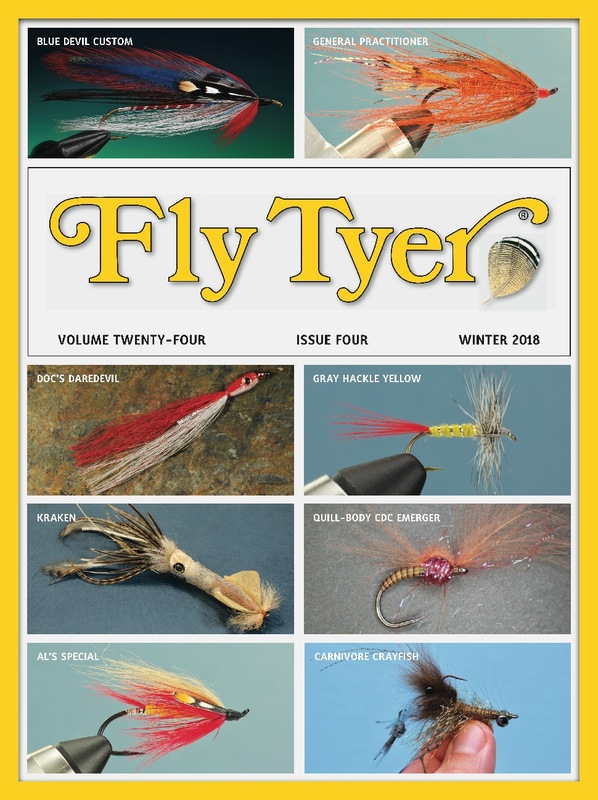 Hopefully the techniques I share will help take your tying to another level and give you some insight into realistic fly tying. Stonefly nymphs are probably the first flies most tiers want to make. Whether it is a stonefly nymph or any other type of pattern, there is no limit to the detail you can add. Although it is time consuming to craft, the stonefly in this article is fairly straightforward and requires only a few materials: thread, foam, monofilament, and chenille. That’s it! Having a vise with pointed jaws and good holding power is a key to tying realistic flies. This type of vise gives access to the hook when making all the parts of the fly and holds the hook securely in a variety of positions. Keep in mind that hooks are not always designed to fit the particular fly you are tying. It is often necessary to modify a hook. You might want to bend the hook to make your fly appear as though it is moving, or the shank might be too short for the fly you wish to tie. You can extend the length of the fly using narrow-diameter wire, such as the .031-inch stainless steel wire I use in this pattern, or you can substitute the shank of another hook. Whichever method you use, you can lengthen or shorten the shank as you go along, or reattach the hook eye as you come to the end of the fly. Because this is a display fly, I have chosen a new Partridge hook for its display-quality finish, but you can use any 3X-long grasshopper hook I use a small piece of shaped flat plastic, such as a section from a plastic fork, as an underbody. Whatever plastic you use, first smooth the edges with a fine file so it does not cut the tying thread. A little prep work will save you some frustration later on. Hook: Partridge CS54 or any 3X-long grasshopper hook. Thread: White 3/0 (210 denier). Abdomen and wing pads: Fly Foam. Gills: Stiff-fibered chenille and ostrich herl. Antennae and tail: Maxima chameleon monofilament. Legs: Tying thread over monofilament. Eyes: Plastic dumbbell eyes or melted 20-pound-test monofilament. Realistic stonefly nymphs are tied using a lot of different materials; the majority of ingredients are stretch elastic. I prefer using thin foam because it is so easy to color using permanent markers, and the ink bleeds together, which gives me the realistic look I am trying to achieve. The color I start with is not always the color of the finished fly. For this particular fly, I start with tan foam and color it yellow. This yields better results than just starting with yellow foam, plus the yellow ink bleeds well with the other colors when I coat the foam with clear nail polish. The amount of time the colors sit before coating determines how much they will bleed together; the longer the colors dry, the less they will bleed. When using yellow and brown, like on this pattern, I apply the ink and then coat the foam with polish about 10 minutes later. I then quickly place the foam in the freezer for a few minutes, which gives it a nice sheen. Regardless of the brand of yellow marker I use, if superglue comes in contact with the ink, the color turns bright red. If it is necessary to do any type of gluing, seal the yellow ink first. And when making something as detailed as this stonefly, I color the parts of the insect after performing each step rather than waiting until finishing the fly; if a section doesn’t come out right, I can simply retie that part of the fly. The legs and wing pads are some of the first things you’ll notice on a well-tied realistic stonefly nymph. Do not make these parts before constructing the fly; instead, craft them as needed to determine their proper size and proportions. Here’s how. Color the fly using inexpensive disposable brushes. Apply the ink using brushes to avoid contaminating the markers with other colors. I also seal the foam using Tuffleye or one of the other light-cured acrylic finishes. When using a light-cured acrylic, the colors do not blend so much, so experiment with pieces of scrap foam and see what results you prefer. The ink from some markers bleeds more than others, which also affects the results. Both stoneflies in the accompanying photos were colored exactly the same with yellow and brown markers. On the darker fly, however, I immediately coated the colored foam and then brushed the ink so the yellow turned light brown. On the stonefly in the tying steps, I let the ink thoroughly dry to avoid bleeding, resulting in a much lighter color. Once again, experiment with scrap pieces of foam, markers, and clear coats to discover which results you prefer. As for coloring and marking the flies, I have spent countless hours studying photos of stoneflies as well as the real insects, and there are literally thousands of different pattern markings. Don’t feel as though you must be exact when coloring your fly. I learned how to make the legs from the late David Martin; I am not sure if he created this method, but I learned it from him many years ago. It is simple but very effective and practical. First, wrap pieces of monofilament with thread in the shape of legs. Color the wrapped thread to your liking, and then coat with clear nail polish or a light-cured acrylic. As with the foam for the abdomen and wing case, I prefer using white or tan thread colored yellow. Keep the pieces of monofilament side by side when wrapping the thread to create a flat, lifelike leg. (Study the accompanying photographs for ideas.) Make one set of legs at a time and as they are needed; this is the best way to judge the size of the legs as you tie the fly.